I’m so very glad I came. Bangladesh has turned out to be one of the best places to witness a whole range of different things – once wildly successful but now stagnant family planning programs, fascinating environmental activism and policy (did you know they’ve banned polyurethane bags, which were choking drainage systems, instead using cloth or netting carriers? ), some of the world’s largest and inspiringly influential/effective NGOs, a female prime minister (as well as a female leader of the main opposition party), ongoing efforts to promote development in a breathtakingly productive but impoverished country, a play-by-play look at the effects of and humanitarian respose to catastrophic severe weather events (linked to deforestation and climate change), cultural and religious tensions/cooperation in an extremely conservative Muslim-majority society (most women cannot leave their homes unaccompanied by a male relative etc.) and so on. The flood is getting worse. The water will be up to our hotel doorstep before Friday if the waters continue to rise at the same rate (they’re already just a dozen meters down the street). It’s possible that clean water and even food will become scarce inside of a fortnight. It’s the worse flooding in over a decade, but people are still hopeful that it’ll start to subside in a couple of days. Pray for an end to the disaster, people, pray! For future reference, I’m presently in room 401 the Asia Pacific Blossom Hotel in Dhaka. The hotel can be reached at (880) 9880406 or (880) 9884233. Yesterday we took a day trip outside the city (14 million people and growing fast!!) to Sonargaon. Within 5 minutes of leaving the city (which took nearly an hour), the landscape was flooded for miles on both sides. Thank goodness the highway is elevated. When we got to Sonargaon, which contains the remains of the first capital city of the region (formerly East Bengal? ), our rickshaw cyclist had to push us though waist-high water for quite a distance to get us to our destination – a magnificent. crumbling colonial-era rajbari or palace (actually a large mansion) which now serves as a folkart and crafts museum. We paid for some of the locals to row us around the grounds in a leaking, single-paddle rowboat. That was a magical experience, floating serenely through the deserted, flooded gardens and around the stately, dilapitated mansion with ornate stucco-covered verandahs and mosaic-encrusted facades. There were blooming water hyacinths, floating pondweed and dragonflies everywhere. It reminded me of that scene in Spirited Away where the train trundles across the flooded landscape. It reminded me of the Jungle Book river cruise ride in Disneyland. Yet it was like nothing I’d ever seen, if only because it was so truly ethereal, authentic and serendipitous. I’m sure the pictures won’t be able to do the experience justice, but that’s all right, because I have the memory carefully stored away. The sun was starting to get low in the sky when we got back onto our rickshaw and cycled through the ruined streets of Painam Nagar (I promise I’ll put the right name up eventually), a surprisingly closely-packed street lined with the remains of townhouses built by wealthy Hindus who fled to India during the Separation. The facades of these once elegantly and intricately-decorated buildings (now inhabited by poor villagers) are now choked by creeping vines and ferns, slowly crumbling to rubble. Amazing. I felt a shared bond with the discoverers who first laid eyes on the lost city of Petra, or the jungle-hidden ruins of Angkor Wat. That’s what Lonely Planet episodes are made of. Like the tourism posters say, “Visit Bangladesh Before the Tourists Come”. Dhaka city is beginning to flood… I’ll keep you posted. I’m almost ready to say for sure that I’m not taking organic chemistry next year. Which would of course mean that I’m giving up pre-med. So much else to say… maybe later. In a way this is kind of like summer school, except with satellite tv (a real productivity-sapper). I miss South Africa, which is surprising, since I don’t miss places, as a rule. I keep looking around the streets of Dhaka expecting to see Africans but of course everyone is Indian. Bangladesh is a fascinating place, though. For one thing, it’s a Muslim country, more thoroughly so, yet somehow less overtly so than Malaysia, Indonesia or Brunei. It’s also worth noting that (at least as reflected in the popular press) the interest in gender equality and human rights in places like Dhaka and Durban seems to outstrip even basic awareness of such issues in Singapore and even the States, which goes a ways towards refuting the idea that human rights are a “Western” cultural imposition that people from other cultures tend to resist and oppose. It seems to have stopped raining, which is nice. I’m safely in Bangladesh, installed comfortably in the Asia Pacific Blossom Hotel in the diplomatic enclave section of Dhaka. It’s pouring outside (the county’s flooding badly, but the city is fine). I’ve been introduced to the professors and orientated around the area, and given tons of background reading to do on public health issues. I’m off to the airport in a couple of hours, heading into the unknown. Or Dhaka, whichever comes first. This picture was taken by Robin at the Alliance Francaise in Durban, where the Ningizimu banners were being displayed prior to their travelling to Europe for an exhibition tour. Those are truly unique pieces of art. I have yet to get my South African pictures developed, but here are a couple of the pictures I got from other people’s cameras. 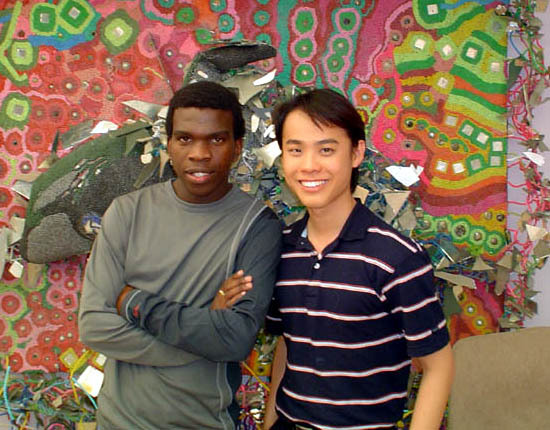 The first picture shows Sizwe and myself at the Ningizimu banner exhibition. Sizwe, of course, is the South African youth I worked with on ThinkQuest all those years back, and the contacts from that experience are a major part of why I spent a month there this summer. 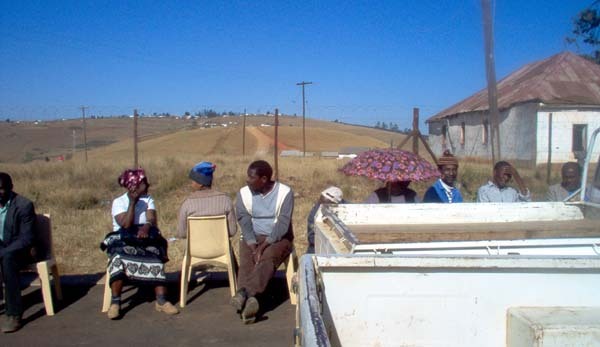 The second picture was taken outside a tribal courthouse in a rural area several hours away from Port Shepstone. Taken outside a tribal courthouse in a rural area several hours away from Port Shepstone. Almost everyone from Practical Ministries was there to attend an information-gathering visit to the Ngcosi (or tribal king). It was an interesting experience, if necessarily very productive. I now have a sixty-day, single-entry visa to Bangladesh. My second visit was much less discomfiting than the first. So by now I’ve sort of processed my South African experience. I’ve seen at least two very different types of weddings (traditional Hindu and Christian-African) and funerals (African & Christian), birthday parties (Indian girl’s 16th and young Zulu woman’s coming of age ceremony, aged 24), concerts (the Ningizimu school’s farewell concert and the Fete de la Musique at the Alliance Francaise in Durban). I’ve seen posh suburbs and crumbling townships, bustling cities and remote homesteads, craggy mountains and sweeping beaches, dense plantations and empty scrubland. I’ve lived with Africans, Indians, Coloureds and White people. I’ve dined with farmers and statesmen, celebrity athletes and radical activists, social workers and teachers, rich and poor, male and female, young and old. I’ve seen a lot, heard a lot, and learnt a lot. Let’s hope I remember a lot too. It’s Tuesday morning and I just got home, in Singapore. I’m heading to the consulate to apply for a visa to get into Bangladesh today. I’ll probably be in Dhaka on Sunday. As I type this, I’m eating a Kit Kat Chunky with a serious defect – it doesn’t have any wafer in it at all. For some reason I got a solid chunk of milk chocolate. And this isn’t the first Chunky I’ve bought and eaten here in RSA, so this is definitely a mistake. Strange. While people in Singapore and the US might be used to meeting people with names like Joy, Faith and perhaps even Patience, people here have names like Justice, Goodness and Kindness. And their Zulu names are literally the same words for things like ‘thank you’ (Siyabonga or Ngyiabonga), ‘success’ (Nompumelelo) and ‘the nation’ (Sizwe). Another inspiring story, and this one has nothing to do with me. In the nearby township of Gamalakhe where several PM employees live (Joyce, Mabusi, Tomfooti etc. ), residents had become increasingly fed up and vocal about the poor service, relatively high prices and almost random fare-hikes of the taxis over the past year (remember that ‘taxi’ in this case refers to fixed-price minivans that offer crucial transportation in the absence of publicly-funded transport). After several failed attempts to get the owners of the various private taxi associations to negotiate with the community – the owners simply ignored the invitations – the frustrated residents actually banded together and held a general strike against the taxis, refusing to take the taxis (and sacrificing a day’s work in the process). Going further than that, the community organisers arranged for private transport companies to provide buses to permanently replace the taxis at a far lower price and considerably increased comfort. The next morning, hundreds of people waited patiently at the bus stops, singing triumphantly and dancing defiantly at the passing, empty taxis. Score one for the people. I think it’s always nice to hear about communities of people who collectively work to claim their right to be part of the running of the services they depend on, and realise their power in numbers, in terms of purchasing power but also moral authority. Does anyone here know of a time when saying this actually worked? A funny thing happened on the way to the NGO. On Sunday night I cried out to God for guidance, for help, for faith, wisdom and strength. I prayed for my words to be seasoned with salt, for hearts to be softened and for minds to be open. I prayed for the future of Practical (Christian) Ministries and for the interpersonal relationships among the team members. Up till that night, I had never really known what it felt like to be willing and able, excited and committed to perform work because of the real implications, the actual effect on people’s lives and their ability to positively touch other lives. I ought to have had that kind of experience with ARC, or ThinkQuest (which clearly did change the course of Sizwe’s life, along with Robin’s and the Ningizimu School, in less obvious ways), but I didn’t. To borrow some of Janine’s sentiments, I always felt vaguely fraudulent, and merely cerebrally convinced of the work’s value. Before Sunday night, the closest I had come to feeling like I had found my niche in life was when I revamped the MOI package at OCS, and even that experience came up short because I couldn’t fully realise my vision (all manner of critical time, resource and support constraints), and because I doubted (and still doubt) the final purpose of the SAF. [This does not mean I believe that national defence is a futile or unnecessary undertaking, but that I wouldn’t want to spend all my time thinking about and preparing for a situation I’m working hard to avoid at all costs. Also, I’m not sure I believe war is ever justified or just. Why not just be conquered? Why not trust God to deliver you? What exactly are we fighting over and fighting for? “Way of life”, “freedom”, “justice” – what exactly do these things mean here on earth, anyway?] On Sunday night, I was willing to be the Director of PM (which I don’t mean as a brag), and I finally understood what the staff here mean when they say that they’re not here for the (scanty) financial rewards or titles or power but because they love what they do, believe whole-heartedly in the value of their work and are willing to accept the challenges and serve (generations of teachers, nurses, police officers, religious leaders and social workers have echoed this sentiment, of course – I just never could quite believe them because I couldn’t match it with any of my own experiences). At this point I’m also reminded of the “leave everything, take up my cross and follow me” lines in the Bible. I seriously did start to figure out finances, how I would take a year off, how I would break the news to my family, friends and the Dins, etc. etc. But only if that was the path that God wanted me to take. “When I came, you told me that you wanted me to add value to the organisation, and now I think I know how I can best do that. I believe that I can be most useful by helping to open up lines of communication within your NGO and help the organisation to be more effective, because I think that PM is at a crisis point right now and something needs to be done. I call it a crisis because an organisation is more than just money and buildings, but also about people, and I think primarily about people. When you have a core team of about eight people – project managers and key staff who essentially run the programmes and the organisation – and you have at least four of them talking seriously about or in the midst of resigning, finding other work or seeking legal action, while the rest of the staff are also unhappy, demoralised and insecure, then I would say you have an internal crisis. “I understand that the staff have had numerous other retreats, time-outs, ‘open-spaces’ and had external consultants come in to conduct workshops, facilitate sharing and help to craft ‘shared visions’, but firstly, you yourself have said that these weren’t as successful as you would have liked, so that warrants more work. Secondly, and more importantly, it sounds like you are coming in to this with a closed mind already, which, if you recall, does not satisfy my second condition. You don’t even know what I am going to do, so you can’t say that I am not going to succeed, just like the previous (nine!) attempts (in less than five years!). [Note: this past history of attempts ultimately goes on to be referred to by five out of the ten people who attend the next day]. “And while I don’t think it’s my job to answer every doubt you may have about my ability to achieve anything – remembering that the apostles doubted Jesus, and there are people today who doubt the moon-landings or that Elvis is dead, showing that people can doubt anything – I can give you at least two other reasons why I believe this will work. So guess which option she chose? That evening I called Doug and asked him to pray for me, and then my calling card ran out of money and I couldn’t call home, or anyone else. I wonder why it didn’t occur to me to use my ICC card? Anyway, I spent the rest of that afternoon and evening cooking, baking, thinking and praying. I won’t record too much of what happened during the next day, only that it wouldn’t be dishonest to interpret it as an unprecedented success or breakthrough for the organisation, nor would it be unfounded to call it a useful step towards better inter-team communication and cooperation. There were references to Oprah and Dr Phil, and four of the ten participants cried at various points, including the Director (!) during her closing remarks. Imagine that. The twenty-two year old Chinese-Singaporean rising-sophomore who had spent just ten days at the office leading a session attended by people including near-retirees and grandparents, graduates and seasoned professionals who possessed well over a century of cumulative work experience which included activism and pulling bodies from the streets during the national violence during the seventies, eighties and early nineties. And made them open up to the point of frightened, emotional tears!! I am so thankful to God, and so in awe of His work. It looks like I will be heading back to Singapore either this Sunday (11th) or Monday (12th). I’m not sure that my work here is done, but we’ll see what happens. It also seems like I may not get to see much of Johannesburg this time round. Pity.